Edgington, David W. 2010. Reconstructing Kobe: The Geography of Crisis and Opportunity. University of British Columbia Press. … we may not know fully if Kobe has provided Tokyo, or any other Japanese city, with the opportunity to prepare itself for a crisis that will invariably come. That will not be able to be recognized until the next earthquake strikes and that crisis is assessed. This paragraph ends David W. Edgington’s extensively researched and detailed monograph on ten years of recovery planning and reconstruction in Kobe, Japan, following the Great Hanshin-Awaji Earthquake. Now, three months after March 11, we might begin to answer his question of what lessons Japan has learned from Kobe about disaster recovery. Judging from Edgington’s research, it might take another decade or more before these efforts can be fully assessed. Edgington, a professor of geography at the University of British Columbia, traces the major contours of political, economic, social and material change in Kobe from the fateful morning of January 17, 1995 through 2005. Edgington provides a straightforward narrative account, thick with empirical and quantitative data, with relatively little discussion of theory. The book is chock-full of figures, tables and photographs, providing plenty of material for analysis and discussion for a diverse spectrum of readers, both graduate and undergraduate. Scholars who have studied the recovery planning process(es) of other disaster-struck cities, such as post-Katrina New Orleans, as well as those who have examined the aftermath of historical disasters in East Asia, will find many intriguing points of comparison and departure. It may also help readers understand and contextualize recovery efforts underway in eastern Japan now. Chapters four, five and six provide the most interesting food for thought for students interested in the study of post-disaster recovery. These chapters describe the different tensions between actors and institutions involved in the years following the Kobe earthquake, especially after the city publicly released its recovery plan within two months of the earthquake in order to secure central government funding, while many victims were still in shelters or scattered across Japan, mourning the loss of over 6,400 people. These plans, as Edgington describes, were met by an angry crowd that besieged city hall for some five hours, haranguing officials for taking advantage of them without their input, as one resident said later, “like a thief at the scene of a fire (火事場泥棒, kajiba dorobo).” The city immediately made an about-face and instituted plans for massive public engagement in recovery planning and redevelopment. Kobe’s plans for reconstruction had involved the identification of eight high-priority areas that would receive significant support from all levels of government, identified as “black zones” on the map. These areas were not chosen for the severity of damage alone, but for other reasons as well, such as specific features that the city thought could be exploited to enhance economic redevelopment. Edgington’s study points out some of the imbalances between the governmental support distributed to the so-called “black zones,” which constituted only three percent of the city’s area, compared to the majority “white zones” — some of which had experienced greater damage — or intermediate, “gray,” zones. Students of urban history will find this study informative, given how Kobe’s experience helped lead to a remarkable surge in the popularity of machi-zukuri (community-building) organizations in Kobe and across Japan from the late 1990s to the present-day. Kobe had already had a history of pioneering these neighborhood planning associations, in which local residents work with the city planning department to develop their area jointly. Edgington demonstrates in three case studies that this strategy of overlaying traditional urban planning — toshikeikaku (都市計画) — upon machi-zukuri-based local planning on a city-wide scale was an entirely new experiment and had very uneven results. Like many of the experiences of other disaster-struck cities, the author’s analysis of Kobe shows that in the rush to catch the wind of opportunity presented by the destruction and reconstruction funding, the ship of recovery must still navigate the shoals of new and pre-existing social entanglements, obdurate economic and political realities, the very detritus of destruction, and the stubborn fact that the slate has not, in fact, been wiped clean. 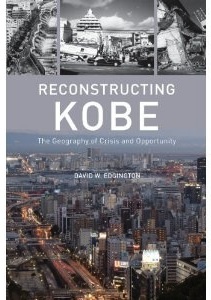 Although Reconstructing Kobe is ambitiously broad in scope, no single tome could reasonably attempt to cover recovery planning and reconstruction in Kobe comprehensively. The best studies generate questions for further investigation, and Edgington does that here. As he notes, his case studies cover “black zones” only, and he points out that “white zones,” which were left to their own devices with little or no government support, actually recovered more quickly than the black zones. His research suggests that rigidly constraining legislation and contentious negotiations between the government and the local people contributed to the slow recovery of black zones. However, one would like to see equivalent research done on case studies within “white” and “gray” areas as well. Finally, the negotiations between local people and the city, mediated through machi-zukuri organizations and professional planning consultants (usually provided by the city) are an interesting site of interaction between experts, officials and local lay people. Students and scholars may find it interesting to open up the details of these negotiations to see exactly how they were conducted, how the salient issues to be negotiated were identified and framed, and how competing visions for what kind of society was to be built were articulated and contested. To supplement this reading, students might appreciate a series of short video clips, in which Prof. Edgington compares Kobe and Sendai. Otani, Junko. 2010. Older People in Natural Disasters: The Great Hanshin Earthquake of 1995. Kyoto: Kyoto University Press and Portland, Or. : International Specialized Book Services. … 고베가 도쿄나 다른 일본 도시들이 앞으로 반드시 다가올 위기에 대비할 수 있는 기회를 주었는지는 확실히 알 수 없을지도 모른다. 다음 지진이 일어나고 그 위기를 평가하기 전까지는 그것을 인식할 수 없을 것이다. 이 단락은 데이빗 에징턴(David W. Edgington)이 한신-아와지 대지진에 이은 일본 고베의 10년간의 복구계획과 재건에 대해 쓴 광범위하고 디테일한 책의 마지막 부분이다. 3월 11일에서 석달이 지난 지금, 우리는 재난 복구에 있어서 일본이 고베로부터 무엇을 배웠냐고 물은 그의 질문에 대답하기 시작해도 될 것이다. 에징턴의 연구자료로 판단해보면, 이러한 노력들이 완전히 평가되기 까지는 10년 혹은 그 이상이 걸릴지도 모른다. 브리티시 컬럼비아 대학(University of British Columbia)의 지리학 교수 에징턴은 운명적이었던 1995년 1월 17일의 아침부터 2005년까지 고베의 정치적, 사회적, 그리고 물질적 변화의 윤곽을 추적했다. 에징턴은 이론적 논의는 상대적으로 적으면서, 많은 경험적이고 정량적인 데이터를 사용한 명료한 서술적 설명을 제공했다. 이 책은 수많은 수치와 도표와 사진을 포함하고 있어서 학부생과 대학원생 모두를 아우르는 다양한 독자들에게 분석과 토론을 위한 풍부한 자료를 제공한다. 카트리나 이후의 뉴올리언즈와 같이 재해가 휩쓸고 간 도시들의 복구과정에 대해 연구하거나, 동아시아의 역사적인 재해 이후의 후유증에 대해 조사해 본 학자들은 이 책에서 아주 흥미로운 비교와 새로운 출발점을 찾을 것이다. 또한 이 책은 많은 독자들로 하여금 지금 일본 동부에서 진행중인 복구를 위한 노력과 그 맥락을 이해할 수 있도록 도움을 줄 것이다. ‘위험한 기회’라는 일본어 危機(위기)에서 영감을 얻어, 에징턴은 재난이 일어난 후의 고베를 ‘위기의 지형’과 ‘기회의 지형’의 조각보라고 묘사했다. 이 개념은 그가 인구학, 법적, 정책적 이유, 자금제도, 그리고 한정된 기한의 압력의 설명력을 중시했음에도 불구하고, ‘위기/기회’라는 이중적 개념을 그의 이야기에서 항상 언급되는 공간적 범주와 연결시킨다. ‘미리 존재하는 상황’, ‘재난 그 자체의 구체적 성격’, ‘정부와 비정부기구의 복구 촉진을 위한 노력’, 그리고 ‘정부에 대한 지역 공동체의 태도와 관계’, 이 4가지 범주가 저자의 재앙과 도시의 복구에 관한 논의의 뼈대를 세우는 데 도움을 준다. 4, 5, 6 장은 재난 후 복구에 대한 연구에 관심이 있는 학생들을 위해 가장 흥미로운 생각할 거리를 제공한다. 이 단원들은 고베 대지진 이후, 특히 시에서 많은 희생자들이 아직도 보호소에 있거나 일본 전역에 흩어져 있었고, 희생된 6400명을 애도하고 있었음에도 불구하고 중앙정부의 예산을 획득하기 위해 두 달만에 복구 계획을 발표 했을 때 사람들과 기관 사이의 갈등을 묘사하고 있다. 이러한 계획들은 화난 시민들이 시청을 5시간 가량 둘러 싸고서 한 시민이 나중에 “불 난 집을 터는 도둑 같다”라고 했듯이 시민들의 의견을 묻지 않은 채 그들을 이용한 것에 대하여 농성을 부리는 상황에 맞닥뜨렸다. 시에서는 즉각 태도를 바꿔 복구 계획과 재개발에 있어서 대규모 시민참여 계획을 도입했다. 고베의 재개발 계획에는 지도에서 ‘블랙 존’이라고 불리는 정부의 주요 지원을 받게 될 지역 8개를 파악하는 것이 포함되어 있었다. 이 지역들은 피해의 심각성 뿐만이 아니라, 고베시가 경제적 재개발을 증대시키는 데 이용할 만한 특성과 같이 다른 이유로 인해서도 선택되었다. 에징턴의 연구는 전체 시의 3퍼센트밖에 차지하지 않는 ‘블랙 존’이라고 불리는 곳과, 시의 대부분을 차지하면서 더 심각한 피해를 입은 곳도 있는 ‘화이트 존’ 혹은 그 중간인 ’그레이 존’에 배분된 정부 지원의 불균형을 지적한다. 도시의 역사를 공부하는 학생들은, 고베의 경험이 지역사회 만들기(community-building) 단체의 인기가 고베와 일본 전역에서 1990년대 후반부터 오늘날까지 급증하는데 기여했다는 점에서, 이 연구가 유익하다는 사실을 알게 될 것이다. 고베는 이미 지역 주민들이 도시 계획부서와 함께 일하며 그들의 지역을 공동으로 개발하는 연계 계획의 선구자적 역할을 한 역사를 가지고 있었다. 에징턴은 세가지 사례 연구를 통해 전통적 도시계획과 지역사회 만들기(community-building)에 바탕한 지역계획을 전체 시 규모에서 결합시키는 것은 전적으로 새로운 실험이었고 굉장히 불균둥한 결과를 낳았다는 것을 보여주었다. 재난을 겪은 다른 도시의 사례와 같이, 저자의 고베에 대한 분석은, 파괴와 재개발 자금이 가져다 준 기회의 바람을 잡으려고 서두르는 과정에서, 복구라는 배는 기존의 혹은 새로운 복잡한 사회관계, 답답한 경제적, 정치적 현실, 파괴의 잔해들, 그리고 완전한 새출발이란 불가능하다는 완고한 사실을 헤쳐나가야만 한다는 것을 보여준다. 이 책은 야심차게 넓은 범위를 가지고 있지만, 한권의 책이 고베의 복구계획과 재건을 완전히 다룰 수는 없을 것이다. 좋은 연구는 앞으로의 추가 연구를 위한 질문을 낳는데, 에징턴은 이 책에서 그러한 역할을 했다. 그가 언급한대로, 에징턴의 사례연구는 ‘블랙 존’만을 다루었으며, 그는 정부의 지원 없이 스스로 일어서도록 남겨진 ‘화이트 존’이 사실은 블랙 존보다 더 빨리 복구되었다는 점을 지적했다. 에징턴의 연구는 융통성 없는 법안과 지역 주민과 정부 사이의 논쟁적인 협상이 블랙 존의 복구를 지연시켰다고 주장했다. 그러나 사람들은 ‘화이트 존’과 ‘그레이 존’에 대한 비슷한 사례 연구를 보고 싶어 할 것이다. 마지막으로, 지역 만들기(community-building) 조직들과 (대부분 시에서 나온) 전문 계획 컨설턴트들에 의해 중재된 지역 주민과 시 사이의 협상은, 전문가와 공무원과 지역 주민들간의 상호작용이 일어나는 흥미로운 장소였다. 학생과 학자들은 이 협상이 어떻게 진행되었는지, 어떻게 핵심적인 이슈들이 정해지고 구성되었는지, 어떤 종류의 사회를 건설할 것인가에 대한 전망이 어떻게 표현되고 논쟁되었는지 정확히 알기 위해 협상의 자세한 부분들을 열어 보는 과정에 흥미로움을 느낄 수 있을 것이다. 이 책에 대한 보충자료로서 에징턴 교수가 고베와 센다이를 비교하는 짧은 동영상들을 참고할 수 있다. – Tyson Vaughan and In Young Kim, trans.